Scan the pages of any publication with regards to the state of art’s funding in recent years and the headlines paint a pretty grim picture. Arts Council England reported that: “According to the Institute for Fiscal Studies, there was a 20 percent reduction in spending by local authorities in England between 2009/10 and 2014/15.” With small independent venues closing at an alarming rate and pitiful streaming revenues putting a strain on artists’ ability to exist as just that, a culture has been created that makes it especially hard on regional scenes and non-mainstream music. In response to this exponential struggle, a new project has been conceived as a means to support innovative, genre-defying music. Outlands has developed a national experimental touring network that aims to tap into existing resources to promote diversity and improve accessibility to marginalised music. 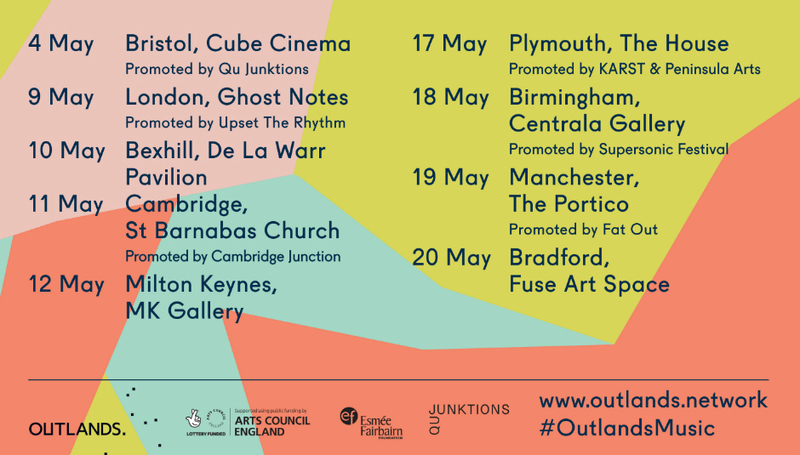 Outlands’ partners are comprised of music and visual arts organisations, creative producers, and independent venues across eight regions for the initial phase of the project. These partners will commission and tour six brand new productions over a two year period beginning in 2018. And they’re kicking off with a stunning line-up. Outlands’ inaugural tour features Matana Roberts & Kelly Jane Jones for a live collaboration. Perhaps best known for Coin Coin, her multi-album work-in-progress, Chicago’s experimental saxophonist Roberts has made some of the most powerful work of recent memory while Jones is a sound artist who has had commissions for Tate Modern and ICA London, as well as residencies at Arnolfini in Bristol UK and Kunstalle Bergen, Norway. The prospect of a collaboration between the two is an exciting one to say the least, and their disparate backgrounds reflect everything that the project stands for. In the spirit of inclusivity, the project will extend its reach from the traditional tour concept to include workshops, Q&As, and live rehearsals in an effort to open up the process of creating experimental music. As an often underground phenomenon, and given the current economic climate, the organisers hope to underline the importance of non-mainstream music to creating a diverse and rich cultural environment. Further tours will also take place this year with Yunohana Variations: Robert Aiki Aubrey Lowe (Lichens), Susie Ibarra & Yoshimio (Boredoms, OOIOO) in June, and Raster Noton VS Drift in November. Projects like these act as the first line of resistance against a potentially myopic, monoculture and should be supported. The organisers have made that easier to do by capping the ticket prices for all shows in an effort to ensure they are widely accessible and they can be purchased here. And with a line up like that who would need further convincing? Tour commissioned by Outlands, produced by Qu Junktions and supported by Arts Council England and Esmée Fairbairn Foundation.